Winter has hit the lakes full on today. There has been a dusting of snow on the highest peaks for the last couple of days but it was right down to valley level today. The original plan was to to do a walk near Ennerdale but the weather prevented that... Good job too as the road was terrible when we tried to head back with a couple of inches settled on the road. This walk was only decided as we approached Cockermouth and was planned as a quick 'nip up and down' just to enjoy the wintery weather. This photo was taken just near Kelswick showing the snow on Ling Fell. A mini snowman sitting on the summit of Sale Fell. This was pretty much the best view we had but it was great walking in the snow. And now an empty summit of Sale Fell. 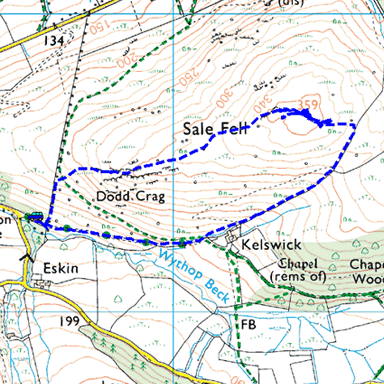 Our route down by Dodd Crag. The path down to the wall with almost a view to Cockermouth.